An excerpt of Rautavaaras Percussion Concerto “Incantations", filmed during the recording with the Romanian National Symphony Orchestra and Cristian Mandeal at the Romanian Atheneum. Interview at the Elbphilharminie Hamburg, Christoph is sharing how “Home” sounds for him. Christophs performance of the Gigue from the Lute Suite in e-minor at the TV Show "Stars of Tomorrow" presented by Rolando Villazon. Filmed at the Stummfilmkino Delphi in Berlin 2016. This is an excerpt of John Psathas “Summary” from his piece “One Study One Summary” performed at the Ars Electronica Center in Linz. The lights of the buildings facade are controlled by the pulse of the music! 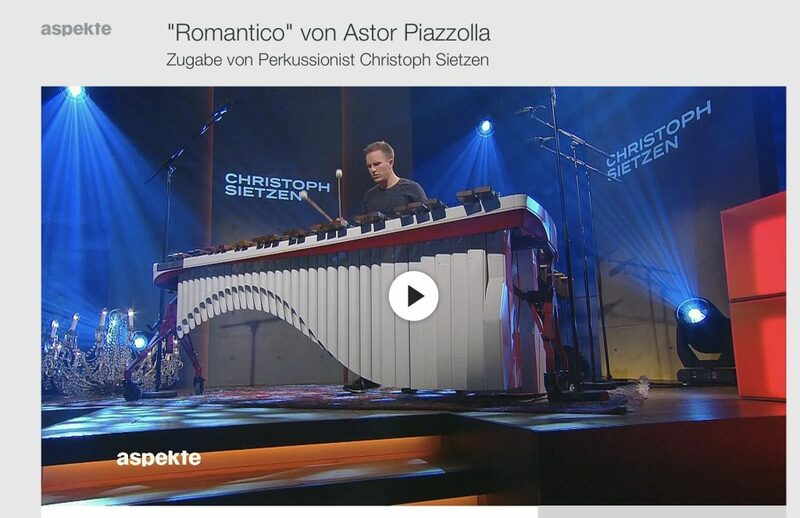 Watch Christoph‘s appearance in ZDF’s TV show “Aspekte”, where he performed Astor Piazzollas "Romantico". Christophs performance of Rebonds B at the TV Show "Stars of Tomorrow" presented by Rolando Villazon. Filmed at the Stummfilmkino Delphi in Berlin 2016. A spontaneous snare drum improvisation that Christoph performed for the Barbican's Sessions video series in Cinema 1. Christoph talking about being a multipercussionist with excerpts of works by Xenakis, Le Roux, Fischer, Psathas, Dorman and Bach. Filmed in 2015. Concerto for 4 Harpsichords in A Minor, BWV 1065: III. Allegro (Arr. for Marimbas), performed by The Wave Quartet and L'Orfeo Barockorchester at Brucknerhaus Linz. Music Video by The Wave Quartet playing Oblivion by Astor Piazzolla starring Jerca Rožnik Novak filmed by Stefan Sietzen.